Paul French is a British author of books of Chinese and North Korean history, and is considered a leading expert on North Korea. 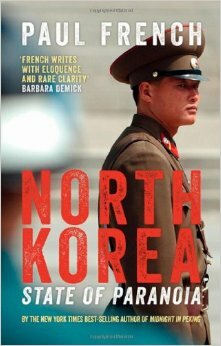 I am not familiar with his previous works, but North Korea: State of Paranoia reads much like a highly-detailed government report, albeit an extremely well-written one, focused almost entirely on the economic history of North Korea, which is essentially an account of decline and descent to economic collapse and ruin. His thesis argues that it is this failed economy that has defined North Korea’s relationships with friends and foes alike throughout its existence and in the contemporary world serves as the pivot point for its nuclear brinksmanship. I feel that it is definitely the quality of the prose that carries the book, for the overwhelming amount of data presented by French in the course of more than four hundred pages would otherwise be a terrible burden for all but the most dedicated students of the topic. French neatly traces the history of North Korea under its multigenerational dynasty of the three Kim’s, its unique guiding ideology known as “Juche” – an unlikely and sometimes conflicting blend of Marxist-Leninism, Maoism and Confucianism – and its stubborn adherence to an economic model unwaveringly devoted to a planned, centralized economy that yet has never paid dividends to a nation ever on the brink of widespread famine and disaster. It is also a history of Cold War alliances with the USSR and the People’s Republic of China, and hostility to the United States and South Korea — the other half of a divided nation that it once tried to conquer and absorb in the Korean War that brought the Americans and Mao’s China in on opposite sides. The USSR is now a memory, China has gone capitalist, South Korea is an Asian economic giant, but some six decades after that conflict went from hot to mostly cold, rifles still point warily at one another across the no man’s land of the Demilitarized Zone (DMZ) and North Korea recklessly and inconsistently rattles a nuclear saber under the nervous glare of the United States, which still has thousands of American boots on the ground on one side of the DMZ. The failed economy, tenaciously clinging to a long obsolete planned socialist model, remains according to French the core of North Korean woes and the key to understanding its isolation, its rigidly closed society, its paranoia and its advertised nuclear threat. The author reveals that not only do few outsiders know more than a very little about the almost inaccessible nation, the North Koreans themselves have been sequestered from the world for so long that they have nothing to juxtapose against their own bleak hardscrabble existence. French makes the point that whereas the economically disadvantaged and politically controlled citizens of the former USSR and the eastern European socialist republics could clearly glean that life was far better and freer in the West, the average North Korean has scant exposure to anything beyond the closed borders of their pariah nation. We learn also from French that North Korea has been, at least since the uneasy truce that brought the Korean War to its close, largely an afterthought in American foreign policy characterized by benign neglect at best — that has only loomed large briefly from time to time as one of the various dysfunctional Kim’s has surfaced to threaten open hostilities to various neighbors. As famine and the chronic brink of absolute collapse of the state into mass starvation has become the status quo, North Korea has learned that the only way to successfully engage the international community is through an ever-lengthening shadow of belligerence that essentially results in a temporary backing off in exchange for food relief from the outside. The reader is reminded of a dog who only gets fed if he bares his teeth. Amazingly, this strategy has continued to bear fruit – pun fully intended – through a string of administrations in Washington, although there were some attempts at longer-range engagement during the Clinton years that offered certain unrealized potential. It should surprise no one that as bad as things were in the North Korean-American relationship, it was the Bush Administration’s tactless approach that derailed whatever hoped-for agreements had lurked tenuously on the horizon. George W. Bush and his team of incompetents – who could hardly carry a cup of coffee across a carpet without spilling it – in another uninspired celebration of the boneheaded, provoked the North Koreans, by branding them as one of the hyperbolic “axis of evil” triad, to abandon their inflammatory rhetoric and actually detonate a nuclear weapon, in response to which the resolute Bush team did … well … nothing. Under Obama, it seems that our current foreign policy is to ignore Kim3, so the more things change the more they stay the same. It is a bit disappointing that French does not devote more time to the contemporary political climate and to address that detonation of a bomb as a certain game-changer, but perhaps because it has failed to manifest itself as such in international politics he feels it unworthy of special attention. In this, I am not sure that I agree. French’s analysis does make clear that there are really very few options available to policymakers. Kim’s habit of holding the international community hostage with nuclear threats in order to obtain food for a near-starving population seems ludicrous on the face of it, but it is not entirely irrational. I recall reading of British anger in World War I at the American sponsored program led by the young Herbert Hoover to feed the famished in occupied Belgium; the Brits noted coldly but accurately that this benefited the German belligerents, as well. While right-wingers can decry propping up a hostile regime with food, would it serve anyone’s interests if the mass-starvation of millions of people was allowed to come to pass – especially because that regime is both paranoid and nuclear-armed, and therefore potentially unstable? As noted earlier, this book reads very much like an institutional report, so it is pregnant in details. Conspicuous in its absence is any human element to the narrative. There is a little bit more than a biographical sketch of the first Kim — Kim il-sung, the founder of this bizarre nation — but beyond that it is difficult to get a feel for the North Korean people, the elite or the peasantry. It is an isolated society, to be sure, but there have been refugees and defectors, so it should have been possible to add real people to the plot. What is not lacking throughout the book are acronyms — hundreds of acronyms — of agencies, organizations, and the like, which underscores that sense of reading a report. Perhaps these acronyms are essential to this type of study, but I found at least some of these superfluous and could not help feeling that French delighted a bit too much in their use. Fortunately, a convenient alphabetical index of translated acronyms is included at the front of the book, but there are after all far too many to memorize and even a handy key such as this cannot help but disrupt the narrative flow. Certain shortcomings aside, French is to be credited as a fine writer whose narrative is never permitted to turn dull even though it contains all of the ingredients of the potentially ponderous. As I turned the final pages, I was pleased that I had read it and would definitely recommend it. I owe a debt to French: because of his reasoned analysis I now feel capable to form opinions and hold an intelligent conversation about North Korea with some sense of confidence.